Adapts "Divided They Stand" and "Juggernaut"
The continued Bio-Emergence of wild Digimon has kept the Tamers busy, and increased their skills, but they've still got problems. Henry and Takato watch a battle between a Flybeemon and Renamon, who is attempting to prove that she can be strong without Rika, and Rika seems only to willing to let her work alone, because Calumon shows them that she's thrown away her deck of cards. But when Renamon is trapped in a losing battle with Harpymon, Rika comes to her aid and helps her Digivolve and destroy her opponent. The two are reconciled, as they realise that they need each other. Chapter Nine: "A Dozen Digi Disasters"
The Tamers arrive on the scene as the Juggernaut's effects are felt on their own Digimon, and are confronted by a sneering Yamaki - but the smirk is wiped from his face when a powerful Digimon uses the Juggernaut to enter the real world. The Tamers' Digimon Digivolve to Champion and battle the creature, Mihiramon, together, but Kyubimon and Gargomon are defeated, and Takato starts to realise that he and Guilmon are connected even more than he knew when he starts to feel Growlmon's pain, and they communicate through their minds. Spurred on to win, Takato is able to summon a Blue Card, which he uses to Matrix Digivolve Growlmon into WarGrowlmon, who vaporises the shocked Mihiramon with his Atomic Blaster. Adapts a little bit of "Grow Mon Grow," "Snakes, Trains, and Digimon," "Back to Nature, Back to Battle," and, belatedly, part of "Much Ado About Musyamon"
In the wake of Mihiramon's defeat, Takato convinces Rika and Henry that they have to work as a team to stop threats like him. However, he's then confronted by Kazu and Kenta, who want to know why he's been ditching them lately, and Takato, unwilling to keep secrets, introduces them to Guilmon. While the four of them then spend the day playing in the park, Henry and Rika are caught up in a battle with a snake Digimon, Sandiramon, in the subway. Impmon alerts Takato to this, and he and Growlmon race to the battle site, where they help to destroy Sandiramon. Before he deletes, however, Sandiramon warns the Tamers that he is but one of twelve Deva Digimon. Concerned by this new development, the Tamers begin patrolling the city regularly, and when a black out occurs, are confronted with Sinduramon, the rooster Deva. Thankfully, he proves to be little challenge, as a dunking in a river crispy-fries the electrically-powered chicken. Chapter Eleven: "When You're Feelin' Blue..."
Adapts "Duel with the Deva" and "Digital Beauty"
After bumping into a strange man after buying Digimon cards, Kenta discovers an odd card among his new ones which he asks Henry to check out for him. When Henry slashes it, it turns into a Blue Card, and he has his father scan it - but the data in the card brings some memories to the surface in his father's mind which he keeps hidden from his son. Then, two more Devas, Vajramon and Pajiramon, Bio-Emerge, and the Tamers engage them in battle. Vajramon is impressed with Renamon's skill, and leaps away with her. As Rika runs after them, Gargomon is facing destruction at Pajiramon's hands. Henry makes the choice to try the Blue Card, which Matrix Digivolves Gargomon into Rapidmon, who destroys Pajiramon with his Tri-Beam attack. They then set out after Vajramon, who has taken Renamon to a stadium and extended the offer to her to join with the Devas. She refuses, wanting to stay with Rika, who then arrives just in time to slash a Blue Card that appears in her hands, Matrix Digivolving Renamon into Taomon. Taomon destroys Vajramon with her Talisman of Light attack just as Rapidmon and the others arrive. Chapter Twelve: "Impmon's Impish Adventures"
Adapts "Impmon's Last Stand" and "Out of the Blue"
When Impmon has a brief clash with the horse Deva, Indramon, and is saved by Renamon, he goes on his own mini-rampage to blow off steam and make himself feel big. Meanwhile, Kazu is presenting Takato with a home-made Blue Card when Indramon reappears, and all the Tamers gather at his location, only to find Impmon trying to battle him. Renamon stops anyone from getting involving, knowing the battle was important to Impmon, but when Impmon is beaten into submission, the Digimon Digivolve to Champion and attack Indramon. Unfortunately, his Horn of Desolation redirects their attacks, but when Takato uses Kazu's card, Growlmon becomes WarGrowlmon again, and destroys Indramon. Adapts "The Boar Wars" and "A World Apart"
The Tamers manga went through at least two preliminary logo designs before the one on this finished volume was settled on. See Volume One's entry for the details on the first logo. 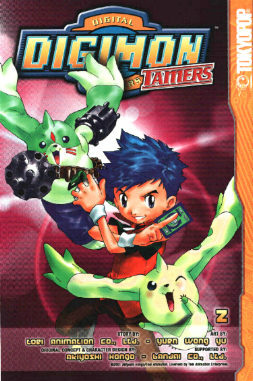 The second design, which appeared on preview images of Volume Two's cover (right), gave the series the "Tamers" title, with the word appearing in red underneath the Digimon logo. The third and final design, visible on the image above, first showed up on advance images of the third volume's cover. Note that it still makes use of the 01/02 "Digimon" logo, rather than the modified season three version. Also note that this volume's cover changed colour from the grey-blue of the preview image to the purple of the released version. The volume opens with some details not in the anime - that the Tamers have been fighting numerous other Digimon lately. Raremon, Tortomon, Deltamon, Thundermon and Fugamon are shown. Calumon shows Takato and Henry Rika's deck in the park, right after Renamon's battle with the Flybeemon. Also note that since "Dream a Little Dream" was cut from Volume One, this is the Tamers' first direct meeting with Calumon in the manga, yet they don't seem surprised by him, and Jeri knows his name in chapter thirteen. He and Terriermon express familiarity as in the anime, by doing their little dance routine. No explanation is offered for this. Impmon's scenes with Renamon are dropped, hence there's no flashback to Impmon's days as Ai and Mako's partner, or even a mention of the kids. In a rather strange scene in chapter eight, rather than see Hypnos scientists experiment on DarkLizardmon, we instead hear them state that they have apparently been able to create a Digimon themselves. When the Juggernaut is activated, the Tamers all arrive on the scene at the same time, and are confronted by Yamaki as a group, instead of having him just confront Takato, then throttle Henry a little later. The Champion Digimon all attack Mihiramon at once, rather than individually, as they did in the anime. In an odd but effective fusion of different episode scenes, Kazu and Kenta confront Takato in a scene modelled on that from "Much Ado About Musyamon," except rather than wanting a card game rematch, they want to know why he's not been around lately. He takes them to see Guilmon, again, as in "Much Ado About Musyamon," but here, they don't run away in terror, and play with him in the park, like in "Snakes, Trains, and Digimon." As such, Kazu and Kenta weren't involved in "Grow Mon Grow," and all of the other school kids who met Guilmon in "Snakes, Trains, and Digimon" don't appear in this version. Rika and Henry's establishing scenes from this episode are dropped, and we are thrust directly into their battle with Sandiramon. The events of "Back to Nature, Back to Battle" are almost entirely dropped. There is no camping trip at all - a blackout simply hits the city, and Takato and Henry discover that the culprit is Sinduramon, who is then quickly tossed in a river. The whole section lasts only about three pages. Rather than the boy from "Duel with the Deva" finding the Blue Card, it's Kenta. Consequently, the Tamers are not looking for anyone in Akihabara - they just happen to be on the scene with Vajramon and Pajiramon Bio-Emerge. Instead of apparently being deleted, reforming, then requesting that Renamon come with him, as in the anime, Vajramon simply grabs her in the middle of the fight and departs. While the anime appeared to have Renamon missing for some time, the manga has the events of "Digital Beauty" occurring mere minutes after the defeat of Pajiramon. Chapter twelve begins with Impmon's troublemaking, and we see his first fight with Indramon and rescue by Renamon in flashback form. Again, there's no mention of Ai or Mako. Makuramon doesn't appear in the adaptation of "Impmon's Last Stand" or "Out of the Blue," as he did in the anime. When Indramon battles the Tamers for the first time, it's the only time - he doesn't disappear and then reappear and wreck the city as he did in the anime, so most of the events of "Out of the Blue" are absent, beyond Takato using Kazu's card to Matrix Digivolve Growlmon. Consequently, there are no scenes with the Monster Makers. Chapter thirteen marks Jeri's introduction in the manga. She knows about Guilmon, and, as noted above, she knows Calumon by name, but it is not explained how. Makuramon makes his first appearance in chapter thirteen, in human form, two 'epsiodes' later than he did in the anime. When Jeri slashed cards in the anime, they had no effect, but in the manga, they actually have a negative effect on Leomon, hurting and weakening him. Beyond that - and the explicitly nasty death of Kumbhiramon, where we clearly see him get chopped into two bits - the events of "Jeri's Quest" are fairly well preserved. Chapter fourteen contains a scene not in the anime, as Janyu Wong flashes back to how Yamaki approached him to work with him. Yamaki mentions that he has found the other Monster Makers, but they still do not appear in this chapter. The Tamers do not pursue Makuramon into the city and get sidelined by the appearance of Vikaralamon - the big pig's Bio-Emergence itself is what brings them in. The Tamers do not learn how to summon Blue Cards, hence their Digimon don't go to Ultimate during the battle. The Juggernaut strikes just as the fight starts, anyway. WarGrowlmon is the only Ultimate to appear, after the Juggernaut is shut off, and there's no "primal scream" sequence - he just rips into Vikaralamon. When Vajramon and Pajiramon Bio-Emerge, the members of the crowd that we see running away from them appear to be Takato's father, Henry's mother, and Jeri, all making their first appearances in the manga before they get any kind of proper introduction. While chasing Leomon, Jeri calls him "my precious" - a reference to "The Lord of the Rings," specifically, the turn of phrase that Gollum uses to describe the One Ring. Rather stupidly, the manga doesn't even attempt to hide the true nature of Makuramon when he first appears in his human form, labelling him "Makuramon" in an introductory caption.